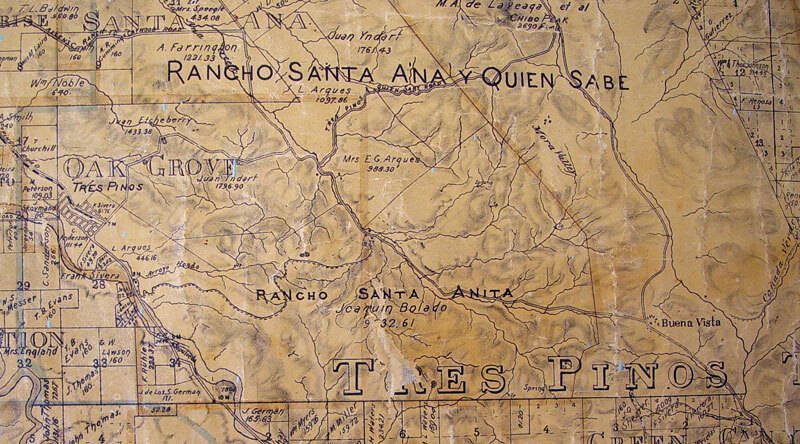 Welcome to version 1.0 of a historical blog containing dated entries documenting some of the history of Rancho Santa Ana y Quien Sabe in the region including and surrounding Tres Pinos, California. Tres Pinos is about 7 miles southeast of Hollister, which is about 50 miles southeast of San Jose, California. The purpose of this blog is to share the early history of the rancho with friends and neighbors who currently live on the ranch lands and with anyone who is interested in the history of this part of Alta California before, during, and after the arrival of the Americans. How To Navigate this Site: Daily entries containing historical information appear in this left column; scrolling to the bottom of each page shows a link to previous pages containing hundreds of Previous Entries. The column at right contains introductory text, a search field, and quick links to events organized by date, names and categories. The main subject of this inquiry is Joaquin Bolado of Santander, Spain, who came to Monterey in 1849 aboard the Schooner Maria and became a naturalized citizen of the United States in 1853. 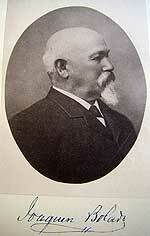 Bolado, a self-described capitalist according to the 1880 census records, lived in San Francisco. He was a director of the Farmers and Merchants Bank of Hollister and president of the Farmers Merchant Company of Tres Pinos. He was a member of the San Francisco Society of California Pioneers, a member of the Odd Fellows Lodge, and he voted as a Democrat. The column at right contains a link to a detailed biography of Bolado written in 1893, the year before his death. The original successful claimants of the Mexican land grant of the two ranchos, Manuel Larios and his partner Juan Miguel Anzar, received their patent for the ranchos from President Buchanan in 1860. Joaquin Bolado, together with his partner Jose G. Arques, purchased his main holdings of Rancho Santa Ana in November 1866 from the adult heirs of Manuel Larios, and in August 1867 from Larios’ minor heirs. Bolado then sold many large parcels of the ranch to local owners, and ran a ranching operation on the portion of land that he kept which he named Rancho Santa Anita. In 1875, he sold the entire 9300+ acre Rancho Santa Anita only to re-purchase it again at public auction in 1878 because of the buyer’s inability to pay the mortgage. His only daughter Julia Bolado, known as Dulce, treasured the land and the stories of her mother’s family that included the Abregos, Carrillos, Estradas, Vallejos and Governor Juan Bautista Alvarado who granted many of the ranchos in California, including this one. As a result of her father’s death in 1894, in 1909 Julia inherited Rancho Santa Anita and a parcel near hollister, Potrero de Lynch. In 1938 she donated 54 acres of the Rancho, Bolado Park, to the State of California’s 33rd Agricultural District for the benefit of the people of San Benito County. The inspiration and most of the data here describing the history of the combined rancho comes from a two-volume Abstract of Title from 1875. The Abstract documents deeds, agreements, and probate activities, most of which can be found in the county recorders’ archives in Salinas and Hollister (including copies of records from Salinas after San Benito County was carved from Monterey County in 1874). This document was kept in the Bolado family and rescued from inadvertent loss twenty years ago by a generous friend. Without it, it would have been impossible to construct this history, locate the original documents, and understand how they relate to the rancho. This blog contains links and short excerpts from websites, books, newspaper articles, and in some cases full text of original documents seen in public county records. It will soon include passages from Julia Bolado’s memoirs that describe her love of the rancho and its history, with its deep roots in Spanish California. It begins by outlining early California history from 1769 which sets the scene for Governor Figueroa’s order secularizing the missions of Alta California on August 9, 1834, and Francisco Javier del Castillo Negrete’s first unsuccessful claims for the ranchos in December of that year. From the beginning of the Spanish era, the two adjoining ranchos were documented as two separate entities that were always considered together. Negrete’s first claim was for Rancho Quien Sabe on December 7, 1834. He added Rancho Santa Ana to his claim eleven days later, on December 18th. Four years later, after Negrete had returned to Mexico and abandoned his claim, Manuel Salvador Larios and Juan Miguel Anzar claimed Rancho Santa Ana on December 29, 1838. Months later, on March 30, 1839, they added Rancho Quien Sabe to their claim. Larios’ and Anzar’s claims to the combined rancho were granted April 8, 1839 by the tenth Mexican governor of California, the constitutional governor of the department of the Californias, Juan Bautista Alvarado, on April 8, 1839. After the American conquest under the Treaty of Guadalupe Hidalgo, all Spanish and Mexican land grants had to be verified by the United States Board of Land Commissioners. Manuel Larios and the heirs of Juan Anzar received their patent for the ranchos from President James Buchanan on May 1, 1860. Rancho Santa Ana y Quien Sabe has had many owners, whose transactions are documented in this blog. And like all of California, it was claimed by a rapidly changing series of political entities in a relatively short time. The ranch was originally the home of the Amah Mutsun people. With the arrival of Spanish colonists in the late 1700’s, like all of California, it became a part of the Kingdom of Spain (El Reino de España) in the region called Nueva España. As a result of the Mexican War of Independence, it was claimed as part of the Mexican Empire; after 1824, the Mexican Republic; and governed under the Ayuntamiento de Monterey. For ten days in 1846, it was a part of the California Republic, also known as the Bear Flag Republic, until it was annexed to the United States. It was part of the region captured by the United States during the Mexican-American War which was settled by the Treaty of Guadalupe Hidalgo in 1848. Since 1850, the ranch has been a part of the State of California in the United States. It has been a part of San Benito County since 1874. Rancho Santa Ana y Quien Sabe has been governed by three Spanish military governors of California Nueva, seven Spanish governors of Las Californias, three Spanish governors of Alta California, sixteen Mexican governors of Alta California, one president of the California Republic, seven American military governors, and thirty-eight governors of the State of California. NOTE: If you click on a post’s title (the Permalink), and you see the error message “Sorry, no posts matched your criteria,” that’s a bug in WordPress, the excellent blogging and hosting software used to power this blog — some of their servers don’t handle dates before 1970 correctly. If you quit your browser and come back to this page once or twice, you’ll eventually log into a different server where the pre-1970 historical date error doesn’t exist.